3D printing for military applications provides engineering freedom, superior product performance, and up to a 70% weight reduction. Without the traditional design-for-manufacture engineering constraints, Direct Metal Laser Sintering (DMLS) allows for cutting-edge tactical gear, weaponry, and more. i3D MFG is the first DMLS provider in North America to own the EOS M280, M290, & M400 x 4 an advanced system that builds industrial 3D parts from metal powders. We pride ourselves on providing one of the largest selections of metal powders, including custom powders, in the United States. Direct Metal Laser Sintering (DMLS) is driven by 3D CAD models to fuse microlayers of metal powders together using 400-watt lasers. This creates a virtually 100% dense and fully functional production part. i3D MFG’s 3D-printed military products can be printed with conformal cooling lines, lattice and honeycomb designs, and complex internal geometries that would otherwise be too costly or impossible to manufacture via traditional machining or casting. These innovations result in lighter weights, advanced performance, and custom production in small batches. With DMLS/DMLM, 3D metal printed products are constructed in days or weeks instead of months or years. 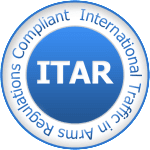 We perform our military 3D printing services in the United States, meeting all ITAR requirements. i3D™ Manufacturing is a certified woman-owned business, giving our clients bidding advantages with U.S. government contracts.